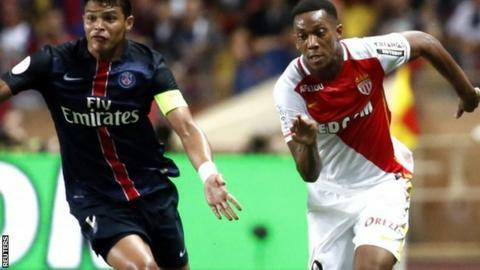 Louis van Gaal has told Manchester United fans he bought Anthony Martial for the club's next manager. United paid Monaco £36m to sign Martial on transfer deadline day. The 19-year-old forward could end up costing £58m with various add-ons. Speaking at a private function for United's executive ticket holders on Wednesday, Van Gaal said Martial would be of more use to the man who takes over when the Dutchman's contract expires in 2017. "He is for the next manager," said the 64-year-old. Van Gaal believes that man will be his current assistant and former Manchester United winger Ryan Giggs. Speaking to an invited audience of about 1,000 for 40 minutes at Lancashire's Old Trafford cricket ground, Van Gaal said he "feels" Giggs will be his successor. Although Van Gaal has previously backed Giggs as a future United boss, the club's hierarchy have not confirmed that is their intention. Giggs joined Van Gaal on stage at one point to answer pre-submitted questions. The Dutchman praised United's supporters for sticking with him last season when results, especially in the early weeks of his tenure, were poor. He also said Wayne Rooney, England's new top goalscorer, was one of the best captains he had ever worked with and that he now looked at Sir Bobby Charlton, whose record his captain has just taken, with greater affection having become more aware of his career achievements. Asked about France international Martial, Van Gaal said: "The fee is ridiculous." Martial had completed just four 90-minute appearances prior to the start of the season, and Van Gaal added: "The problem is when Manchester United try to sign a player, it costs £10m more. When we are selling one, the clubs always want to get them for less." There were no questions on the future of goalkeeper David De Gea, whose agent Jorge Mendes was at United's training ground on Thursday. The 24-year-old saw a move to Real Madrid collapse on transfer deadline day and is expected to be back in the squad to face Liverpool on Saturday (17.30 BST kick-off). United are reported to be considering offering the Spaniard, twice the club's player's player of the year, a new contract with a release clause. Meanwhile, it has been suggested that a delegation of senior players spoke to Van Gaal several weeks ago about his rigid approach and training ground methods. The Dutchman surprised his players by making them train before they could go home upon their arrival back in Manchester from the club's pre-season tour of the United States. And several national newspapers claim dissatisfaction among the first team squad with the Dutchman's inflexible style of play has also been raised. United have declined to comment.